Today I’m knitting some swatches to measure my gauge and to get a feel for what it’s like to knit with the yarn. Yesterday I mentioned that the recommended gauge and needle size surprised me. Rated as a DK/Light Worsted, the recommended needle size is a US5 [3.75mm] for 20 stitches and 26 rows over 4” [10cm]. Being a little skeptical about this, I put it to the test. I achieved 20 sts and 30 rows over 4″ using a US5 [3.75mm] needle. Sure enough, my gauge was right on at 20 stitches using a US5 [3.75mm] needle, however, my row count was 30 over 4” [10cm], even after blocking. Since most patterns will instruct you to knit until X inches, this should not be a factor. The fluffy aura of the yarn tends to be a little sticky, as most fluffy yarns can be. 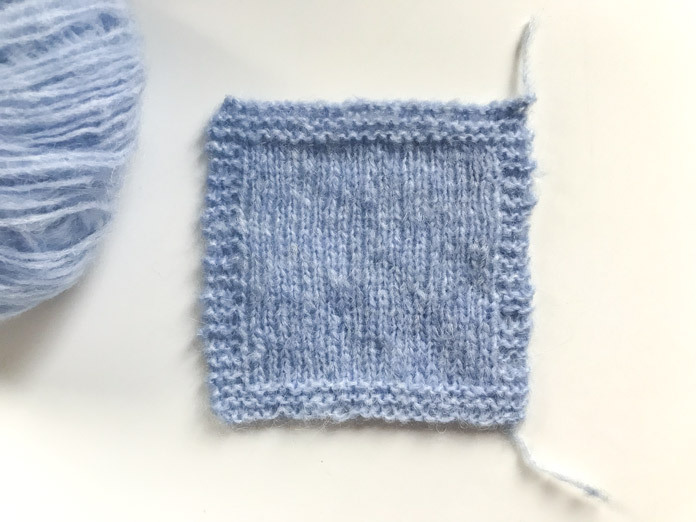 I used a technique that I often use when a particular yarn is sticky or when the plies separate while knitting. I use my left thumb to gently pull the fabric away from the left needle. 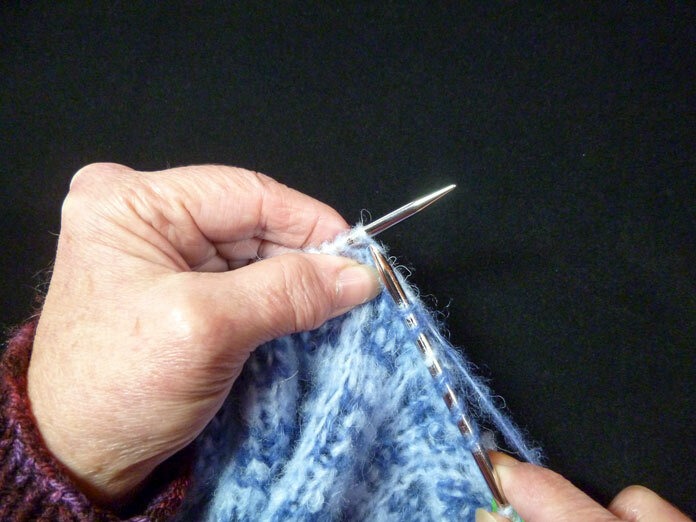 Use your left thumb to gently pull the knitted fabric down from the left needle. By doing so, you create a clear hole for the right needle to slide through without getting caught in the fluff, or catching an individual ply. This makes for a much smoother knit. I’m pleased with the fabric created by the stocking stitch swatch, but curious as to how it will work with patterning. 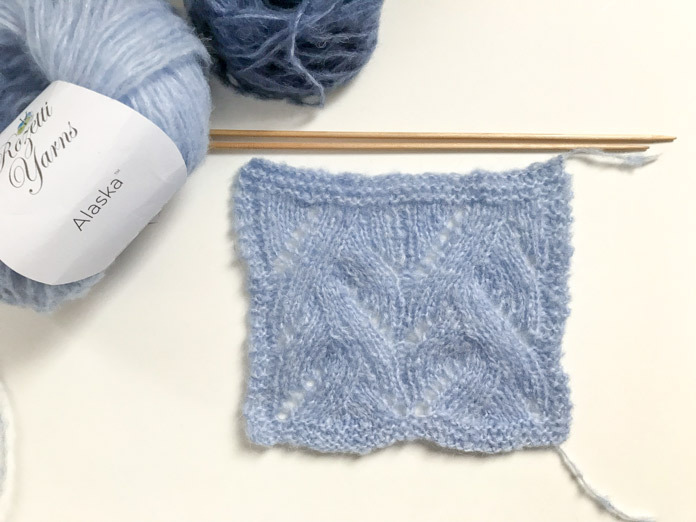 If you’re using a yarn with a lot of texture, variegated, or one that has an aura such as Alaska, it’s important to ensure that a detailed pattern isn’t lost by the yarn characteristics. So I went through my Japanese Stitch Bible and selected a pattern that had yarn movement and lace. After blocking the swatch, you can clearly see the pattern definition, although much softer than it would be with a high twist yarn and no aura. A good knitting friend of mine always states that you should never assess a lace pattern without blocking it first. This is good advice and also means that you should always swatch the pattern to ensure the detail comes through before you start knitting the project. I’m pleased with the results, and can honestly say that I like knitting with Alaska when I applied the technique described above. Join me tomorrow as I start knitting the Choux Cowl.